The cave is an Iphone game still in development. You know all that games like Aurora Feint where you have to join three or more pieces. The Cave goes one step further and uses a three dimensional environment where pieces float freely in absence of gravity. I´m a single developer so I decided to start posting my thoughts about this game and getting help from users worldwide. The first working version is almost finished so you will probably see it on App Store quite soon. 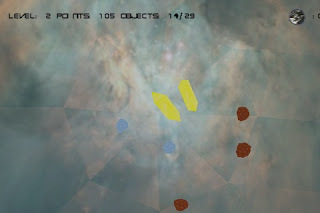 You play inside a semi-transparent diamond-like asteroid where at least three types of asteroids are floating. There´s also a shop where you can buy other types of objects (as a Joker object) and increase the level of your previously acquired objects. I´ll post more details later but I´d like to know your opinion. Hope you like it!